When visiting the Reichstag building, be prepared to wait for a while – at least if you are planning to climb the glass dome on top of the Reichstag. Since admission is free and the view is nice there is usually a long queue in front of the building. But even if you actually don’t make it to the top, a visit to the site can be almost just as nice – if not even nicer. If the weather is nice, you could for example just hang out on the green in front of the building and enjoy the view. And there is also a lot to discover nearby. The large inner city park Tiergarten is basically neighboring the Reichstag site. The Brandenburg Gate is just a five minute walk – literally around the corner, down the street. Next to the Brandenburg Gate, another five minutes away you’ll find the Memorial to the Murdered Jews of Europe. And five minutes down Strasse des 17. Juni you’ll find the Soviet War Memorial, featuring two Russian WWII tanks and a huge bronze sculpture. How to get there: You could take the U55 to station Bundestag – but currently the U55 is only available from the stations Hauptbahnhof, and Brandenburger Tor. Alternatively you could take the S-Bahn to Brandenburger Tor and take a short walk (about five minutes) or jump on one of the buses stopping near Reichtag / Bundestag. 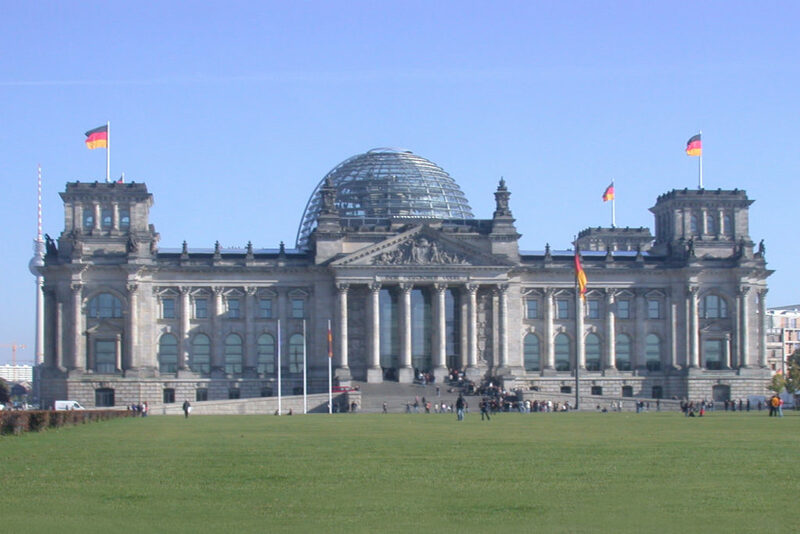 The most popular option would probably be the Bus 100 stopping right next to the Reichstag building.